I bought some quinces from Marrickille Markets the other day and poached them in red wine with a cinnamon stick and cardamon pods. The fact that they ended up being quite delicious says more about the quinces than any effort on my part, as I didn’t really know what I was doing. 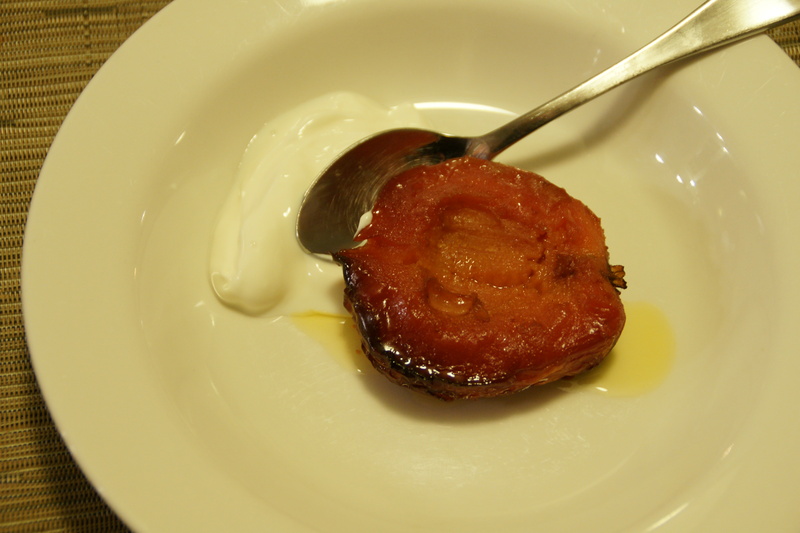 Coasting on that success and feeling the chill of Sydney’s recent cold, grey wet days, I decided to try Stephanie Alexander’s recipe for Quinces Baked in Honey from her fabulous book The Cook’s Companion – a book that is dog eared, butter stained and much loved by me. Halve but do not peel quinces, then remove pips and core from each with a spoon to make a neat hollow. 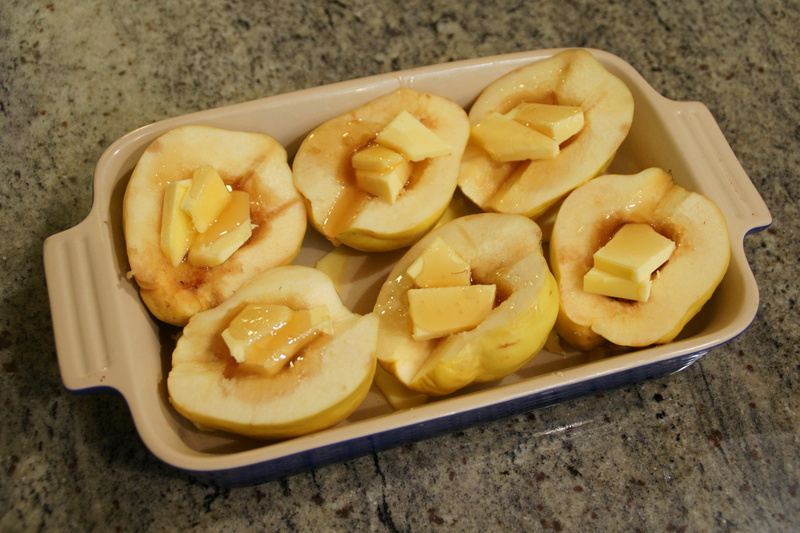 Select a gratin dish that will hold the quince halves snugly and grease with a third of the butter. Arrange quinces halves hollows uppermost. Divide remaining butter and honey between the hollows and pour the water gently around the sides. Cover with foil and bake for at least 3 hours until the quinces are soft and a rich red (turn quinces over after 1.5 hours). 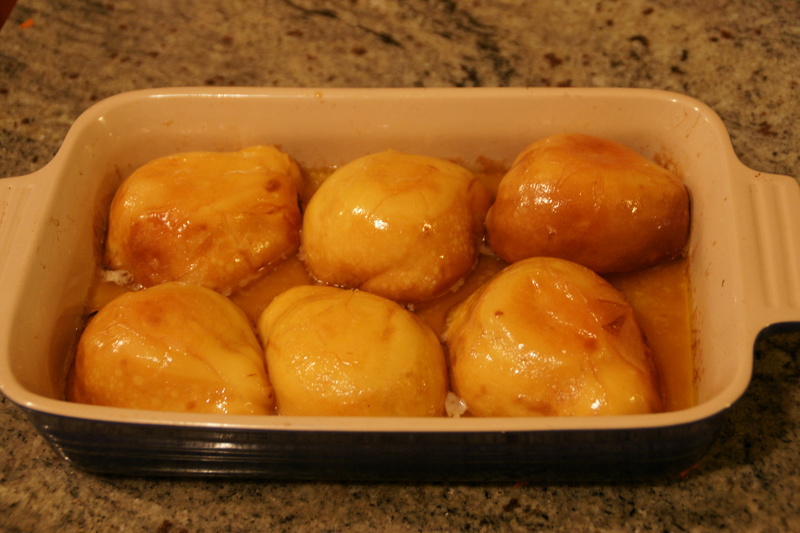 Serve hot or warm with hollows filled with honey juices and offer thick or clotted cream. I served mine with greek yoghurt purely because that is what I had. I must admit that I am not a big fan of butter, or fat in general, so I struggled with the amount of butter used. Next time I would use far less (and my husband would be outraged as he has a love of butter only a man with almost no body fat can sustain). 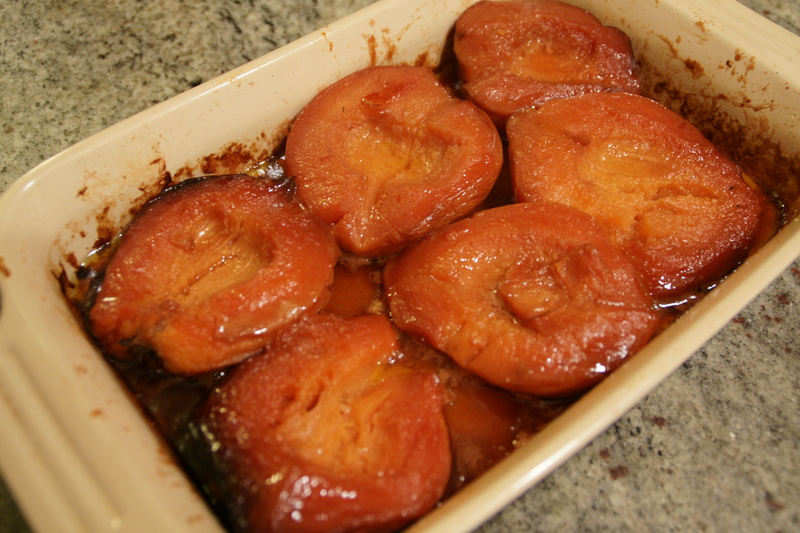 I also baked the quinces for quite a lot longer than 3 hours because I got distracted. Having made those qualifications, the texture was lovely and the dish itself was a warm and fuzzy winter type dessert. 3.5 stars. I just got some more quinces from Katie and need to do something. This might be it. Haven’t cooked quinces like this before. Usually I poach them in a vanilla flavoured sugar syrup. I like how you served it with yogurt – I think I would have done exactly the same. Having three family members with quince trees in their backyards I have no shortage of quinces to cook with each autumn but I do find that the typical very heavily sugared syrup style poaching to be too much sweetness for me and generally just end up making quince chutney (divine!). So I really like the sound of this recipe with only 4 Tbl of honey. I’ll have to pull out the Campanion and check it out.